What do you think will be the next big evolution in RDS? Thread: What do you think will be the next big evolution in RDS? Spoiler alert. The PA and Sig are MADE IN CHINA. As an aside, I spent a few minutes doing some internet research on the Sig Romeo3 I found for $299.00 and posted in this thread. That is $100.00 off the going rate and I thought it was a deal. But then I found DHgate.com a company in China which makes or distributes the same sight and even sells them wholesale. It's got the Sig logo on it. Look at the features of this sight as you scroll down. It is the same as the Sig. Or is it a Sig? These guys either make this sight for Sig or they have stolen the entire set of blueprints, including electronics, from Sig. They make a 3-14X and a 5-20X. If I am reading this correctly, the night vision is digital. Short battery life 8-12 hrs. but you can carry a battery pack attached to the rifle by a wire and extend the life. This optic weighs over two pounds, 2.15 pounds. There are some nice vids on this. There are tons of other features I would never even use. It looks super-hi-tech, like something in a sci-fi movie. For digital night vision all rolled up into a variable powered scope, this looks like the future. The one I had was amazing at night, I could see clearly for several hundred yards as long as there was nothing close in the FOV to reflect the IR beam. Unfortunately, the one I had was defective in that the IR sensor apparently would not deactivate, which made it essentially unusable in daylight. 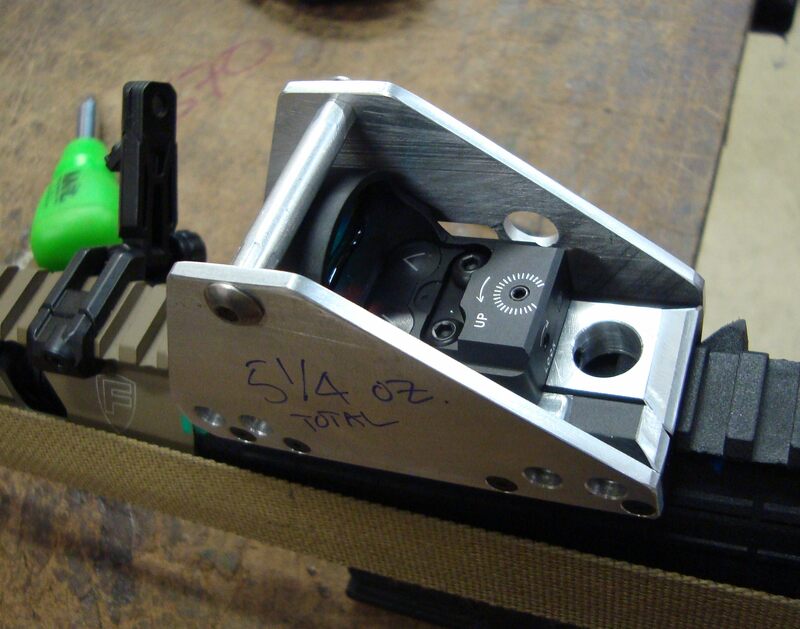 Making the sight more knock-proof is the next step in my opinion..... on a carbine they are generally so vulnerable. Getting it shielded while keeping it small. The attached is basically a quick fleshing-out of a concept that could be made quite a bit smaller and lighter in a subsequent iteration but as-is, gets "protected" done pretty well. An MRDS has a lot of offer for certain applications and the limit is not a hard line, I mean, I've pushed a similar setup to 300M on pop-ups and it was far from ineffective. Thin Al or well supported/structured polymer would get my $$$... great build! Or maybe a metal-reinforced polymer sort of like a Glock frame might work too. I have been meaning to get back to you on this. The optic already has a metal hood. You are really beefing it up substantially with your design. I am thinking overkill. Maybe ok if you are going to take this optic to war but I can't believe it is so flimsy now that it wouldn't work for home defense. Tell me more of your thoughts on your design.